Based on an updated review of the available information on the health effects of exposure to asbestos, NIOSH proposes a new numerical exposure limit amounting to 100,000 asbestos fibers less than 5 micrometers long per cubic meter of air. 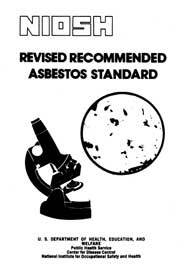 This recommended standard is intended to protect against the noncarcinogenic effects of asbestos, to materially reduce the risk of asbestos induced cancer, and to measure the levels of asbestos by valid and reproducible techniques that are available to industry and official agencies. The information reviewed provides conclusive evidence that exposure to asbestos fiber causes cancer and asbestosis in man. Lung cancer and asbestosis have occurred following exposure to chrysotile, crocidolite, amosite, and anthophyllite. Mesothelioma, lung cancer and gastrointestinal cancer were shown to be excessive in occupationally exposed persons. Mesothelioma developed also in individuals living in the neighborhood of asbestos factories and asbestosis was identified among persons living near anthophyllite deposits. Available data also show that the lower the exposure the lower the risk of developing cancer.